The AIFMI was founded in March 2012 by Dr. Michael HIRT as an initiative of HIRT&FRIENDS GmbH. Dr. Michael Hirt is Director-General of the AIFMI. 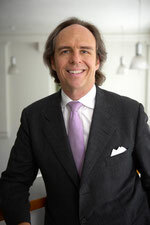 Dr. Michael Hirt is CEO of HIRT&FRIENDS (*2001), a management consulting firm developing and realizing innovative strategies and organizational models for major European and international companies. Previously Michael was with BCG, a global management consulting firm and leading advisor on business strategy. Michael’s goal is to help successful leaders to develop winning strategies and to achieve strategically-aligned positive and measurable change in behavior, for themselves, their people and their teams, which has a high impact on the success of their organization. He tailors his intervention roles according to the precise client needs, because he believes that a consultant who can offer a variety of roles is best able to provide the unique, value-added talents that meet the client needs. These roles include: Keynote Speaker, Strategy Consultant, Strategy Coach, Management Trainer and Executive Coach. All his roles have in common the intellectual leadership, high authenticity, humor and energy that Michael brings to any assignment. Michael has over 20 years of experience in a broad range of industries including: Consumer Goods & Media, Luxury Goods, Information and Communications Technology (ICT), High Tech, Engineering & Metals, Transportation & Logistics and Financial Services. He holds a Master of Business Administration (MBA) 'with distinction' (Dean’s List) from INSEAD, the leading European Business School and law degrees (Dr.) from Vienna University ('with distinction') and McGill University (LL.M.) in Montreal/Canada. He is practicing in German, English and French, as well as in multi-cultural environments and is a lecturer at renowned universities. He was born in 1965. Michael and his family live near Vienna/Austria. Visit Dr. Michael Hirt's personal website here.